Election security is a topic that’s made a lot of headlines in recent years. With many states using voting machines that are more than a decade old, security experts have raised concerns that these aging machines could be vulnerable to hacking and tampering in future state and federal elections. That’s why many states are taking steps to replace their voting machines with new, more secure models that are less vulnerable to intruders. In addition to replacing old voting machines, there is another surprising step America could take to keep elections as secure as possible. By using paper backups, election officials can ensure that everyone who casts a vote in an election is voting for the candidate they want. Some experts believe it would effectively mitigate the damage that could be done in the event of a cyber attack during an election. This approach wouldn’t require voters to cast paper ballots, though. Rather, it would involve incorporating paper into electronic voting machines. When people cast a vote using one of these machines, it would provide them with a piece of paper showing who they voted for in the election. People could then review this receipt to make sure it reflects their vote before handing it over to an election official for auditing purposes. Some states already use systems like this in major elections, but experts believe all states should be encouraged to use them in the future. 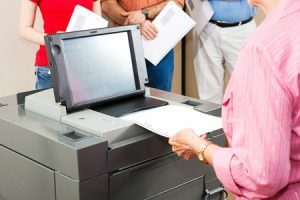 Additionally, smaller organizations that hold elections should consider incorporating paper into their voting processes to ensure accurate results and prevent security issues. Honest Ballot is a company that specializes in helping labor unions, school boards, and other organizations to hold secure elections with the latest voting machines. Call us at 800-541-1851 today to learn more about how we can assist you with your next election. ← Blockchain Voting: What Is It and How Could It Impact Elections?